Like Madonna said: life is a mystery, everyone must stand alone, I hear you call my name, and it feels like home. This recipe came to me in a foodie dream. I answered the call. The most maddening thing is that human brains are wired to derive meaning from the most random of things. Show a person an ink blot an he will tell you he can see an old lady carrying her groceries. We find stories inside the position of the stars. Each culture has made up a story about the creation of the universe. We can’t help ourselves. The more incomprehensible something is the harder we try to assign it a logical explanation. A foodie will derive meaning from how things are arranged on his plate. Why is that? Why did nature create us with this annoying need? Are we meant to satisfy it? Are we meant to accept that we are broken? Is it a grand cosmic joke? While thinking about all this, I made this Lasagna. I purchased fresh lasagna noodles, because they are not dry. I was able to cut them into the shape that I have drawn on a piece of paper. Normally I make lasagna differently. I make thick layers chock full of vegetables, meat or other fillings. Because I was worried my creation would get bent out of shape. I kept it super simple. 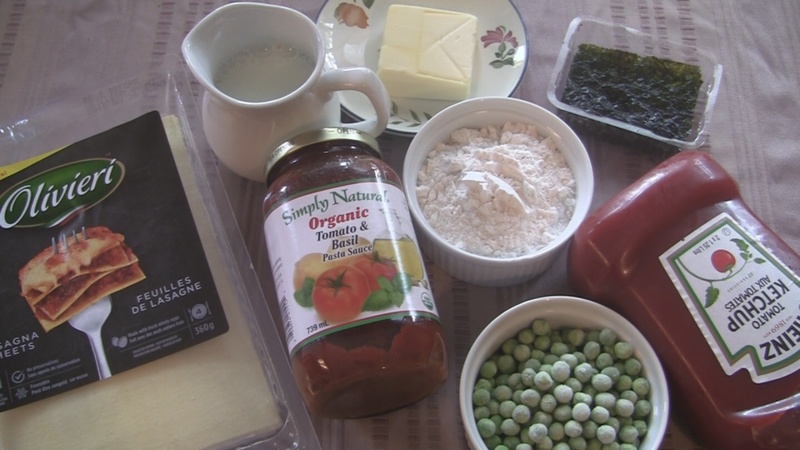 This is probably the simplest easiest lasagna I have made. Noodles + Tomato Sauce + Bechamel Sauce. It constantly surprises me how good simple things taste. This one in particular. It honestly tasted fantastic. I would go as far as saying that I preferred it to the other lasagna that I labor for hours over. Perhaps there is a lesson to be derived from there. I colored the bechamel sauce with ketchup and mashed green peas to get red and green colored sauces. Add a little butter in a pot and melt it. Add a few table spoons of flour and mix. Add the milk and stir constantly until it gets thick. Divide some in a different pot. Add ketchup to the big batch. Add mashed green peas to the smaller batch and put aside. Cut out black tear drops out of the seaweed. Drew a simple strawberry shape on a paper and cut it out. Then I cut out six lasagna noodles according to the shape. Layered tomato,noodle,tomato six times. The pasta package said bake for 35 minute covered in an over that is set at 350. I followed the instructions and it worked. Don’t throwaway the lasagna scraps. Cut them up into crazy shape noodles and you have yourself a side dish for tomorrow. Just boil them in water for a few minutes and add your favorite sauce. Let the lasagna rest for 10 minuted on the counter. Remove Lasagna out of the baking pan and set on a cutting board. 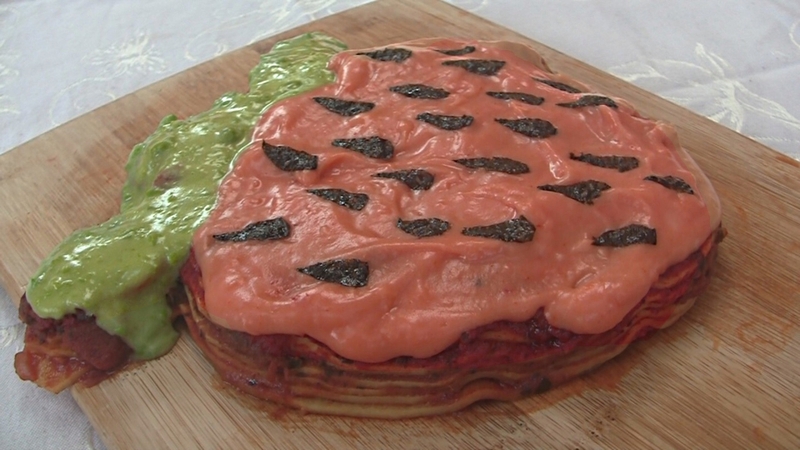 Decorate with greean bechamel, red bechamel and black tear drops to make seeds. I feel so confused. My eyes says strawbery, my stomach says lasagna. Which should I believe? Methinks you read too much. aga, I have been accused of that before.